There's an interesting story behind why I picked my recipe for Slow Cooker Cranberry Pulled Pork in Sugar Pumpkins. This month’s Secret Recipe Club assignment is the Fit Mama Real Food blog by Heather. So I poked around her blog wanted to see if she did any slow cooker recipes . Luckily I found one, Cranberry Pulled Pork in Sweet Squash Boats, that reminded me about this Thanksgiving’s request from my family. You see, my son Nathan doesn’t want eat turkey for Thanksgiving and asked me to make him barbecue! Usually I make a crockpot ham with chutney sauce. However, after reading over Heather’s cranberry pulled pork, I thought I would turn it into Slow Cooker Cranberry Pulled Pork in Sugar Pumpkins making it perfect for a Thanksgiving feast. First, I decided to used dried cranberries in my Slow Cooker Cranberry Pulled Pork. This would also make it easier recipe to make year round, too, since it’s hard to find fresh cranberries during the spring or summer. The cranberries are already sweetened, which eliminates the need for the sucanat or any other sweetener. Second, I decided to serve Slow Cooker Cranberry Pulled Pork in pumpkins instead of squash boats just because that’s the seasonal thing to do. 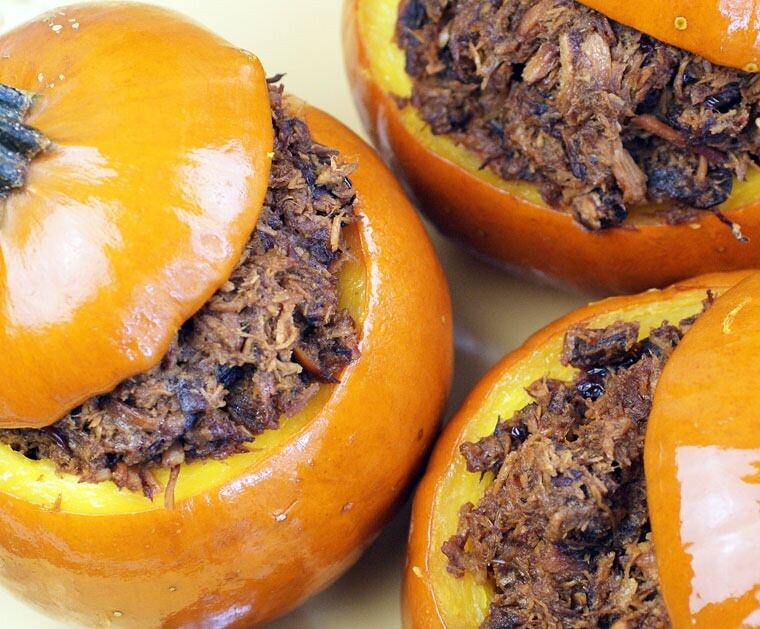 Slow Cooker Cranberry Pulled Pork in Sugar Pumpkins would be an awesome recipe to make for a party for a DIY sliders bar. So keep Slow Cooker Cranberry Pulled Pork in mind if you’re doing any holiday entertaining! Barbecue sauce, pickles, coleslaw, etc. In a small bowl, mix together spices. Sprinkle spices over both sides of meat and rub to coat evenly. Place pork loin into slow cooker. In a medium bowl, mix together dried cranberries, raisins, and broth. Pour on top of the pork. Cover and cook on low for 10-12 hours, or high for about 5 to 6. Cook until the pork can be shredded easily with a fork. When the pork is nearly ready, wash the outside of the pumpkins. Pat dry with a clean dish towel or paper towel. Then cut the top of the pumpkin off to make a nice lid. Scoop out all the seeds (save them for roasting!) and stringy bits. Place pumpkin skin side up in a glass baking dish. Add 1/4 inch of water and cover pan with plastic wrap and vent. Microwave on high for about 10 minutes ) until pumpkin is tender but not caving in. Spoon the pulled pork into the pumpkins. When serving, scoop the inside of pumpkin along with the meat. 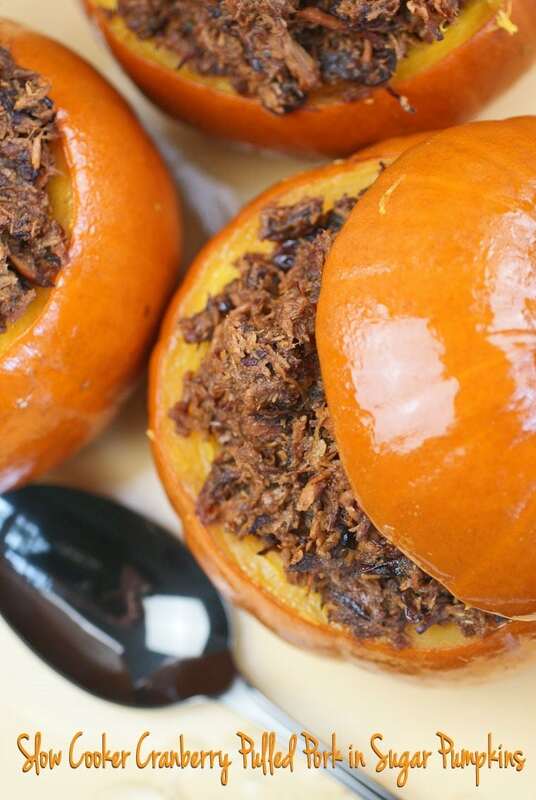 Serve the pulled pork with the mashed pumpkin in bowls or on buns or bread to make pulled pork sandwiches. Add your favorite barbecue sauce, pickles, coleslaw and other favorite pulled pork sandwich accompaniments if you wish. Posted in Crock Pot and Slow Cooker, Gluten Free, Recipes, Thanksgiving, Veggies and tagged cranberries, party food, pork, pumpkin on November 10, 2014 by Anne-Marie Nichols. You are so creative! These are darling and sound delicious! I really liked low the flesh from the pumpkins added some veggie goodness to the pork. You could do this in other squash during the rest of the year. This looks so delicious! What a great way to use mini pumpkins that are still in season! Love your modification so that it can be made all year round! And those sugar pumpkins make for the cutest presentation. Glad you guys enjoyed it! This looks so good and fun to serve, I think I need to put it in my list to try for one of my Tapas Nights or maybe Boat Club? I live in the south, so pork is one of the main proteins people eat around here. I live in Georgia, so I know what you’re saying about pork. I’ve never seen so many varieties of cuts – and such large cuts – until I moved here! Pulled pork is my favorite! Love this holiday version! I usually do a spicy pulled pork, so I’m glad to now have this recipe to add to my pulled pork repertoire! What an interesting recipe! I’ve never used dried fruits in a bbq but I could see how it’d be a nice texture and sweetness element. What cute food styling too! Lauren, the dried fruits added a lot of sweetness that went so well with the pork and eliminated the need for bbq sauce, IMO. What a great presentation for your awesome Slow Cooker Cranberry Pulled Pork, this is perfect for the season. Thanks for sharing a great recipe for the SRC! Thanks Miz Helen, it’s perfect for the season and year round, too! What a great recipe to make for this time of the year! I bet the pumpkins add amazing flavor to the pork! I love that you made these in the slow cooker! There’s something super comforting about pulled pork, and I bet the pumpkin adds loads of flavor to the dish! Pumpkin is sort of neutral tasting, so it goes with anything. It also adds a lot of nutritional value and fiber, too! 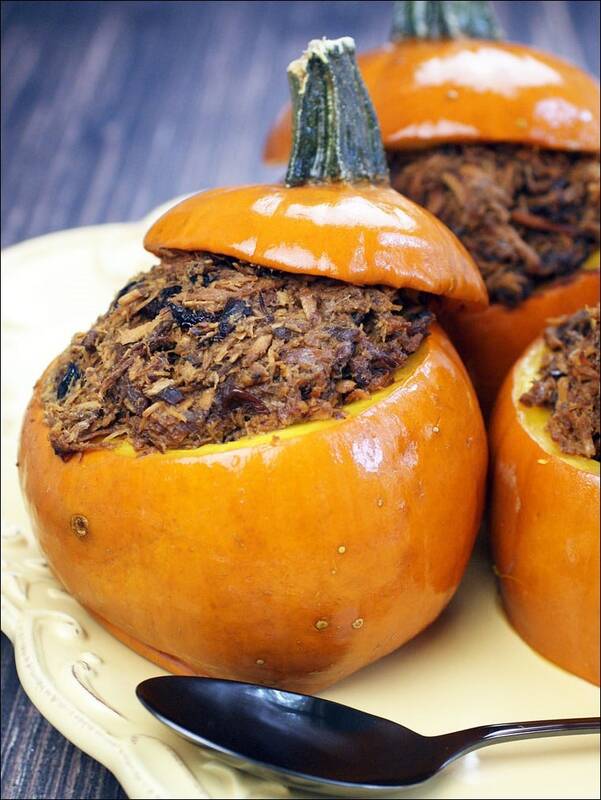 The idea of putting pulled pork in little pumpkins is pure genius. Thank you. This sounds great and I love the presentation! Thanks Danielle. It was a fun way to present pulled pork, that’s for sure! What a fun and festive idea! Sounds delicious! It’s yummeeeee. It’s so sweet from the cranberries and raisins that you don’t need barbecue sauce!